I have to confess that this is the first babydaytrip destination that I didn’t visit in person. As I was otherwise indisposed, MJ and his dad set off on their own, tasked with reporting back on their day out. 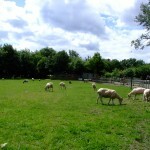 Mudchute Park & Farm covers an area of 32 acres close to Millwall Docks. 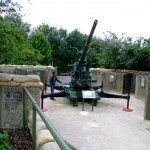 On the day of babydaytripper’s visit, the community run farm was celebrating the launch of its restored Ack Ack (anti-aircraft) gun – one of the Docklands area’s key defences during WWII – with a 1940s-inspired street party. This aspect of the farm’s history is explored in a small exhibition of artefacts and documents. 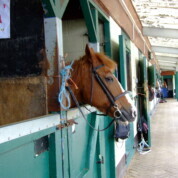 There is a large courtyard at the centre of the farm, at the end of which you’ll find stables and an equestrian centre. To one side of the courtyard is a pets corner – home to the farm’s ducks, geese, chickens, rabbits, chipmunks, pheasants, guinea pigs, ferrets, budgerigars, cockatiels and painted quails. Exiting the farm through the main gate you’ll find the larger animals grazing in the surrounding paddocks and fields. 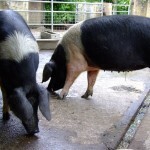 Amazingly for its city location, Mudchute has over 200 animals and fowl – considerably more than your average city farm – with a focus on British rare breeds. Expect to see sheep, cattle, horses and ponies, donkeys, exceptionally friendly pygmy goats (MJ’s favourites), enormous pigs, turkeys, llamas and alpacas. When you’ve seen enough of the farm, explore Mudchute Park’s nature reserve, adventure playground, one o’clock club, duck pond and allotments. MJ and his dad considered following the nature trail, but it was too overgrown to manage with a pushchair. 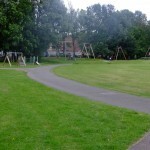 Alternatively, head to neighbouring Millwall Park which has play areas both for toddlers and older children. The biggest, and one of the best, city farms in London. 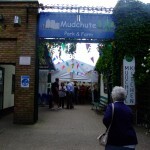 Mudchute Kitchen (operated by “Frizzante”, the people behind the cafés at Hackney and Surrey Docks City Farms) is open Tuesday to Friday, 9.30am to 3.30pm; Saturday and Sunday, 9.30am to 4.30pm. By way of example, a cappuccino costs approximately £2, a full English breakfast costs £7, brunch costs approximately £7 and sandwiches are around £3. Mudchute Park and Farm is accessible to pushchairs. There are baby changing facilities (although only in the ladies’ toilets, which was awkward for my husband on his own with our little boy). Farm: 9am to 5pm every day. The animals go to bed at 4pm. Park: All day, every day. By train: The closest stations are Mudchute, Crossharbour & Island Gardens on the Docklands Light Railway. By bus: D3, D6, D7 or 135.